"In outline color by region. Illustrations include St. Peter's in Rome and the Grand Canal in Venice. The border is of typical Italian design with a nun and priest flanking the map. Maps by J. Rapkin. The edition without the town plans. Date estimated. This copy has a few pages of the Index/Gazetteer, as issued, almost as a sample of the later edition with the complete gazetteer. Earlier editions have a second title page dated 1851, a view of the Great Pavilion opposite the ornamental title page, and an index sheet titled ""Directions to Binder - arrangement of maps"" (Huntington Library copy). 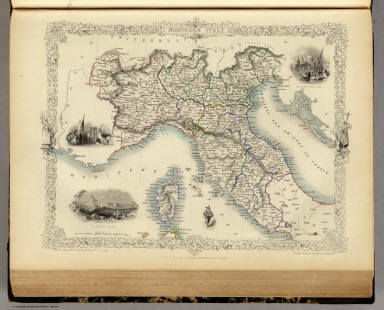 Maps are hand colored with outline color, and bound in half leather marbled paper covered boards with ""Illustrated Atlas"" stamped in gilt on the spine." Cover: Illustrated atlas, and modern history of the World. Title Page: Illustrated atlas, and modern history of the World. Index: Illustrated atlas, and modern history of the World. Scotland (with) inset map of the Shetland Islands. Channel Islands. (with) inset map of the English Channel.